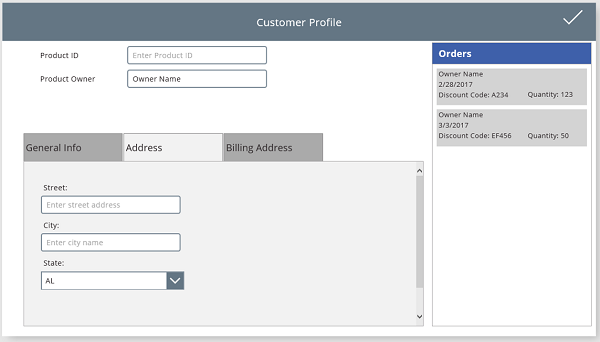 Inspired by our SharePoint MVPs, PowerApps Engineering Manager Carlos Aguilar Mares offers this really practical design for PowerApp business form designers looking for a "Tabbed User Interface" to save space on a wide format application. I enjoyed learning from Carlos and documenting the steps he took to make this happen. Later this week I will post a Part 2 on this topic, which will demonstrate my own tabbed UI design option that would work best for mobile phones which have less space to work with. Important: See the P.S. at the bottom of this blog where I share my PowerApp File, and a PowerPoint Presentation that goes into much more detail (for those that want to try this out exactly as shown below). Here are the three tabs shown separately, where all the controls and formulas are consolidated on a single screen of a tablet-format PowerApp. The first step in this process involves building a blank app from scratch using the Tablet Format. Once the blank app opens, you'll need to select the first layout in the list of template layouts. This is very important for this tabbed UI design, and in fact the key tip that we can learn from: As a result of selecting the layout, we are presented with a "Canvas" control. The only way to get a "Canvas" control on the screen is to select from the layouts panel. After which we will drag with our mouse to resize and copy the Canvas control in order to create 3 (three) identical panels (stacked one on top of the other) which will show up when the tabs are selected. We also add an icon at the top right that we will configure later with a Patch formula so as to submit all the input fields to our SharePont List. 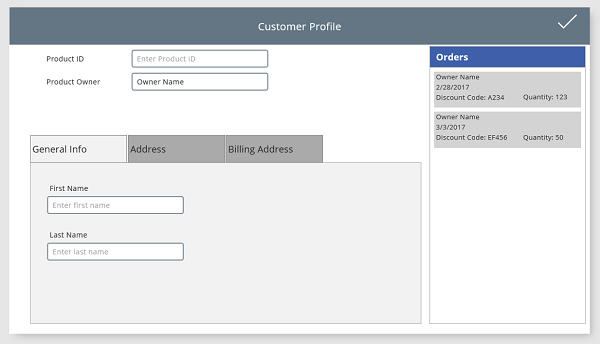 Using typical PowerApp controls, we'll add the labels and the Text Input controls at the top of the form. It's a good idea to name your controls so that you'll find them again easily later. A.) We configure a new gallery for our tabbed navigation, and then B.) 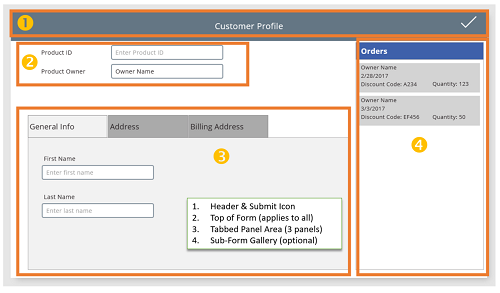 we configure the Visible Property of each panel to display only when its' tab is selected. GalleryNav Gallery: We add a Horizontal Text Gallery above the panels we resized earlier, and configure it with only one (1) data field value for 'Display Name' (you'll have to delete the extra fields that are on the template by default). 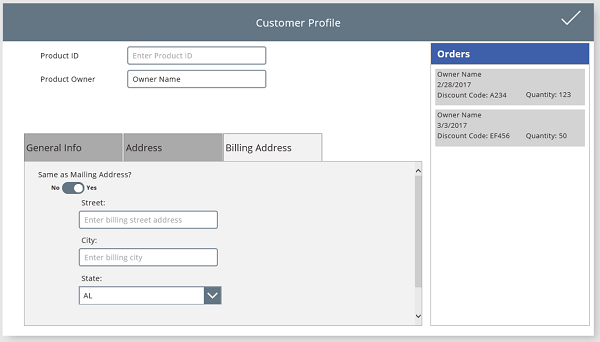 Select the remaining template data field and set its' Text property to ThisItem.Value.DisplayName . Now you should see the gallery with General Info, Address, and Billing Address tabs. Feel free to use your mouse to drag and resize the template area as well, if it looks to large or spaced out. At this point you may add the input controls to each panel, as needed for the tabbed display names. Note: Using a Lookup column will not work in this scenario due to current SharePoint column constraints. Therefore, I used the Order and Title columns as my relationsihp instead (see the PowerPoint referenced in the P.S. below for more detail on the SharePoint lists). FYI for Part 2: Later this week I will also share my own modern mobile design for a tabbed UI that optimizes the space available on mobile phones. P.S. The PowerApp and PowerPoint explaining steps to do this are on my OneDrive here. The PowerPoint explains each and every step in greater detail than this blog. Suggestion: Before opening the *.MSAPP file, I recommend that you create the 2 sample SharePoint Lists using the exact same list names (if you want the app to work without having to change the formulas). Since your SharePoint lists will be on a different URL path, after opening the *.MSAPP file, just remove and then add-back the Connections with the same name from your SharePoint Online Lists. If you use the same list schema/field names, the warning icons will go away as soon as you add-back the connections.